The Jazzy Jeans Scholarship Brunch is presented by the GNO-ABO Charitable and Education Foundation. The GNO-ABO Foundation uses proceeds from the event to provide scholarships to students at Dillard University, Southern University in New Orleans, and Xavier University of Louisiana. 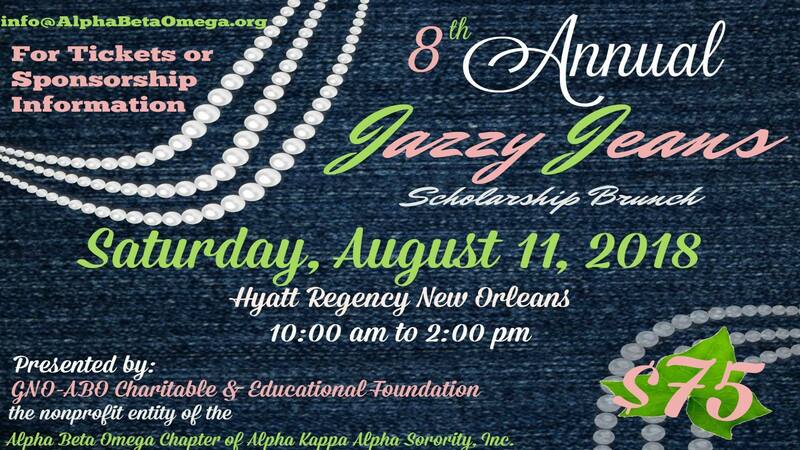 The 2018 Jazzy Jeans Scholarship Brunch will take place at the Hyatt Regency New Orleans on Saturday, August 11 from 10 a.m. to 2 p.m. Thank you for your interest in attending the Jazzy Jeans Scholarship Brunch. Due to an overwhelming response, the 2018 event is sold out! Stay tuned for 2019 Jazzy Jeans details.